In September 1950, police in Miami, Florida accidentally discovered a crime ring that had been stealing thousands of dollars from the local phone company for years. The thieves were young women employed in the counting room of the Southern Bell Telephone Company. They were smuggling money out of the building by hiding coin rolls in their bras. The combination of attractive young women, lingerie, and money proved irresistible to the media, and the exploits of the "brassiere brigade" made headlines across the nation. Marge Connors, a Miami model, demonstrated how a bra can hold coins. A few of the female employees (at least three, but possibly many more) figured out that it was easy to surreptitiously stuff rolls of coins down their bras before the money was placed in the machines. Because the money had not been counted yet, the phone company would not realize the money was missing. It was, essentially, a perfect crime. One of the perpetrators, Betty Corrigan, later told police that girls would stuff up to four or five rolls of quarters down their bra at a time, although they didn't often stuff that many down because it hurt to do so. A roll of quarters weighed about 12¾ ounces and was worth $15. Some girls were smuggling out $150 a day. Officer I. Ray Mills came to the house to investigate the theft. While he was there, Betty Corrigan, one of Marie's co-workers, drove up in a car. When Mills searched Corrigan's car he found three suitcases in it. Two of the cases contained $4107 in quarters. The other case contained almost $1000 in paper currency. When Mills questioned the women about the money, the entire story started to spill out. They confessed to him that they had stolen thousands of dollars from the phone company, and had used the money to buy new cars and pay the mortgages on their homes. The police eventually found Corrigan and Orr to be in possession of $10,000 in cash. It was never made clear why Rita Orr telephoned the police, though it seems that she was unaware of her sister-in-law's criminal activity. When word of the arrest got out, the media went into a frenzy. Reporters dreamed up names such as "the case of the silver falsies," "the case of the clinking brassieres," and "the bra bandits." The most popular name proved to be the "brassiere brigade." The police estimated that at least fourteen people had been involved in the crime -- eight women and six men (husbands and boyfriends). However, the two women at the center of the case were 23-year-old Betty Corrigan and 21-year-old Marie Orr. Corrigan and Orr were repeatedly described in articles as "pretty girls" with "well-modulated 'telephone' voices." Pictures of the young women ran in many newspapers. Despite the highly publicized arrests, the case suddenly hit a legal dead end. The police realized they couldn't charge the women, because, despite the verbal confessions, there was no evidence of a crime. The phone company was unable to specify how much money it might have lost (if any), or when the money had been stolen. Assistant Dade County Solicitor Michael Zarowny explained, "There is no way to tell if the money was taken from the boxes, nor how much. The phone company is not in a position to say if it lost anything. We have no date when the offense was committed, who got the money nor how much was taken." In a separate statement, Zarowny noted, "The girls simply dropped rolls of nickels, dimes and quarters into their brassieres before they were put thru the counting machines. Thus no record of the exact amount of silver could be made." It looked for a while as if the women had committed the perfect crime, but the police were not about to let them get away that easily. Dade County Solicitor Robert Taylor told the press, "If everyone will just keep their brassieres -- I mean their shirts -- on for a few days we will have some cases. It is a question of assembling evidence and charges definitely will be filed." In the end, it was an accountant that ended the brassiere brigade's run of luck. The phone company flew in its long-distance toll records from Jacksonville. An auditor then combed through the records. Eventually, he was able to detect "definite shortages during definite months." Specifically, the auditor was able to prove that on August 23, 1950 "$464.75 was missing from the company's counting room on that day." This finding allowed the women to be prosecuted for stealing "more than $50." It didn't sound like a lot, but it was enough to have the women rearrested on charges of grand larceny. The press crooned, "Justice as elastic as the items in which they carried their loot snapped back today on members of Miami's 'brassiere brigade'." 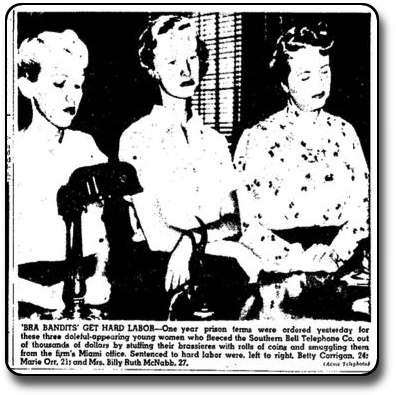 The brassiere brigade (Corrigan, Orr, and McNabb) receive their sentences. It never was clear exactly how much money the women stole. The initial police report, based on the women's verbal confession, estimated the theft to have run into the hundreds of thousands of dollars. However, the phone company, perhaps to save face (and perhaps because it couldn't prove anything else), put the total much lower. It claimed a loss of a mere $18,880. The women said in a statement that they intended "to make full and complete restitution for all money belonging to the telephone company and taken by them." They later appealed. However, they lost their appeal. Several movies have had plots similar to the exploits of the Brassiere Brigade. A 2001 British made-for-TV movie, Hot Money, told the story of a group of British cleaning women who steal money from the Bank of England by hiding it in their underwear. This was later remade for the American market as Mad Money (2003), starring Queen Latifah, Katie Holmes, and Diane Keaton. However, neither of these movies specifically cited the Brassiere Brigade as their inspiration. "Brassiere Coin Collectors Stole $100,000, Say Miami Police." (Sept. 26, 1950). Portland Press Herald. Page 18. "Telephone Girls Freed in Miami." (Sept. 27, 1950). Joplin Globe. Page 4. "Crime Unestablished. Phone Girls Freed." (Sept. 27, 1950). The Post-Standard. Page 2. "Bra Brigade, 2 Husbands Re-Arrested." (Sept. 28, 1950). Portland Press Herald. Page 14. "Found Guilty in Clinking Bra Case." (Nov. 15, 1950). Mansfield (Ohio) News-Journal. No one said how much these girls were making per week. We never get the whole story. The crime was recently chronicled on The Travel Chanel's educational/history show "Mysteries At The Museum", Season 7, Episode 1. And, did they pay everything back? Did they continue their career in crime?